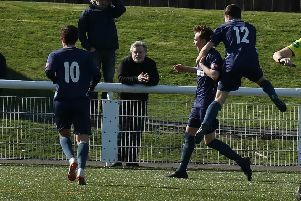 Last Friday evening Lochar Thistle and Abbey Vale played for a place in the final of this season’s South League Cup at King Edward Park Lockerbie with Vale coming out on top. Lochar Thistle took the lead through Mike McGauchie before Graeme Bell levelled for Vale who then went ahead when Dylan Cairnie found the net. A Hayden Edgar header put Vale further ahead before Iain Anderson put Lochar back into the contest. A fourth goal for the New Abbey side by Brodie Turner sealed victory to put them into the final when they lock horns on Wednesday 20th December at Dumfries High School with Heston Rovers to see who wins the silverware. The weather once again had an adverse effect on South football on Saturday with three out of the six South of Scotland League fixtures being postponed. However in the three matches that were played there was a total of 24 goals scored with both Mid Annandale and Threave scoring eight each and Bonnyton recording a 6-0 victory over Heston Rovers. The match at Lockerbie between Mid Annandale and Stranraer was fairly even for the first ten minutes or so but in the 11th minute Liam Gibson put Mids into the lead and two goals from Luke Hammond in the 43rd and 45th minutes gave the home side a comfortable half time lead. Five minutes after the restart Benji Wagner scored goal number four and two minutes later Dean Smith scored as Mids went nap. On the hour mark Mccutcheon scored for what turned out to be a consolation goal for Stranraer. Callum Smith scored a sixth for the home side and seven minutes later Liam Gibson scored his second and his side’s seventh. Sam Copeland completed the rout. Threave Rovers travelled to play Dumfries YMCA and they also recorded the same score line although the home side played the final half hour of the match with ten men after Scott Gordon had been red carded. The visitors goals were well spread with seven different scorers throughout the match with Shaun Milligan, Connor Liddell, Craig Mckeand, Dan Thom, Ben Irving, and substitute Jack louden scoring singles with substitute Ryan Nish bagging a double. Danny Bryson scored the consolation goal for the home side. Bonnyton Thistle were two goals to the good against Heston Rovers by the break with Kerr scoring after five minutes and Tait adding a second with 28 minutes on the clock. Kerr scored a third 11 minutes after the restart and Stevenson scored the fourth with 68 minutes played. Heston played out the final 15 minutes with ten men and McCrum took advantage in the 87th minute with a fifth and with a minute left to play the home side continued the rout with a sixth.